Singapore’s recent unwinding of some property curbs, which initially appeared to boost prospects for developers, may instead be creating new problems. (BUSINESS WIRE)–WEX Inc. (NYSE: WEX), a leading provider of corporate payment solutions, today announced that it will begin issuing virtual credit cards in Singapore, expanding its program in the Asian region that currently includes Hong Kong and Thailand. The total number of properties put up for auction increased in the first quarter of the year, up 25% to 177 properties. While the focus has been on the US, visas for IT professionals to work in Singapore have dropped “to a trickle”, prompting the government to put on hold the review of the Comprehensive Economic Cooperation Agreement (CECA) citing violation of the trade pact. Singapore has refuted reports citing Indonesian police officials which said that Singapore did not want to engage in cooperation on Extradition Treaty and Mutual Legal Assistance requests. The independent auditor drew attention to Note 2.1 in the financial statements which stated certain conditions which indicate a material uncertainty exists that may cast significant doubt on the group’s ability to continue as a going concern. Technological advancements has created new jobs. However, there is a job mismatch. Fresh graduates are likely to hold out against taking on initial offers from prospective employers due to a variety of reasons. For instance, job seekers may not be fully trained for that particular role and apprehension sets in. Coupled with low starting salaries due to foreign competition, job seekers would then likely adopt a wait and see attitude. Hence, the conundrum. According to the Singapore-based The Straits Times, the minimum salary for Filipino domestic helpers will be increased to S$570 starting May 1 to keep pace with exchange rate fluctuations. The Singapore stock market bounced higher again on Friday, one session after it had ended the two-day winning streak in which it had advanced almost 60 points or 1.9 percent. The Straits Times Index now rests just above the 3,175-point plateau, although the market may head south again on Monday. After seeing investors in Singapore duped for years by misbehaving bosses, the city’s stock exchange is taking its fight for justice to mainland China, an exemplar of egregious corporate behavior in the post-Enron world. Two law firms in Singapore and Malaysia have launched fintech practices as the growth of the financial technology sector continues to gain pace in both countries. The first cloud-based virtual Enhanced Packet Core (vEPC) network solution will soon be launched in Singapore by the joint initiative of telco M1 and IT solutions provider Huawei. Economists’ hesitation in calling for a tightening this year despite recent stronger growth numbers underscores a lack of confidence in Singapore’s future growth prospects. SINGAPORE is set to introduce a series of new regulations in a bid to speed up progress towards the city-state’s environment commitments. 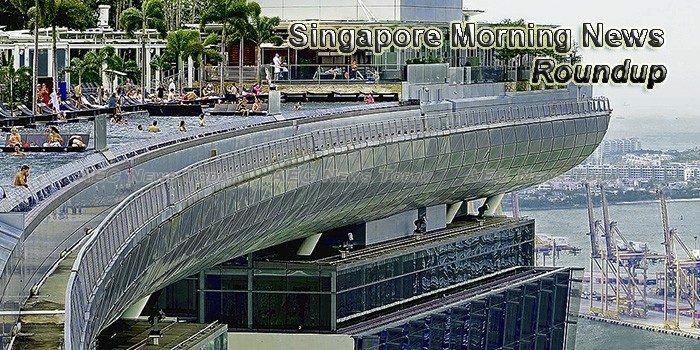 For the first time since the launch of the SGSecure movement to prepare Singaporeans for any terror attack, an unattended suitcase caused a security scare, leading to the closure of Hougang MRT Station for more than an hour yesterday. Private home prices in Singapore continued their decline in the first quarter of this year – the 14th straight month of contraction, according to flash estimates released by the Urban Redevelopment Authority (URA) on Monday (Apr 3). Although salary has been consistently ranked as the most important factor especially for millennials in Singapore, a Randstad study revealed that the importance of job security and financial health of the organisation has fallen more and more compared to five years ago.